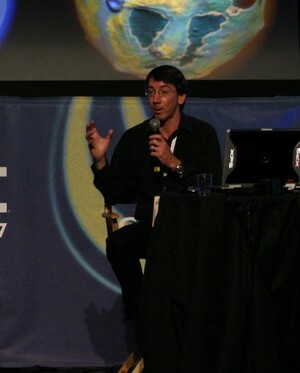 Will Wright is a member of the Academy of Interactive Arts and Sciences. He spoke at the D.I.C.E. Summit® in 2002, 2003, and 2006. He works for the Stupid Fun Club. A: Grand Theft Auto. I thought it was a very compelling game, because it felt very immersive in terms of this whole city that kind of felt like it was alive around you. A: By the total impact my projects have on the world. A: Definitely the research phase. Usually I take a project on because I’m interested in the subject. Usually it’s my base interest that drives me toward turning it into some other kind of entertainment experience. I’m already into the subject I’m researching, and I enjoy trying to find out as much as I can from different perspectives. When I’m learning about something, I become kind of a guinea pig in terms of my model of that subject. I have an awareness of how I’m increasing my awareness in stages. I’m going from a very simple model of whatever it is, to a very complicated model. Then, when I’m trying to turn it into a game or whatever, I try to imagine someone who knows very little about that subject, how they’d ramp their model, what is the first understanding they have of that system, and what’s the simplest way to incrementally improve that model? And at the same time, I’m experimenting with dynamics…the experiences that someone can have. And also how you get them creatively engaged in it: you don’t want to make the thing just about the subject, but also about the player. What is the intersection between that play and the subject? For me, it’s an interesting intersection of the psychology of play, with the science and understanding of the subject matter, and the craftsmanship of experiential design. A: The average person’s patience with new entertainment is roughly equal to my own – I appreciate good design as much as the average end user. Having to reinvent so much technology for every project. I think it’s gotten better. We’re not having to reinvent display drivers every game, like we used to a long time ago. The hardware support has had a huge impact on the game industry. When you look at things like pixel shaders and what not, the hardware is so fast you don’t even want to look for software solutions there, you kind of want to stick with whatever the prevailing paradigm is for rendering. In a lot of ways, I can think of the car industry. They’ll develop an engine and then they might use that engine for five or six years, and they’ll evolve that engine over time. Five or six years later, that engine has gotten fairly obsolete. They can design a much more efficient engine from scratch somewhere around that point. So there’s this cost of reusing what you’ve got versus building something new from scratch. It’s the pace of change I think, that’s one of the reasons why we’re not getting as much reuse as we possibly could – but it’s kind of a double-edged sword, because it’s exciting we’re on Moore’s Law. So I think a lot of this is a side-effect of riding Moore’s Law. A: Yes because it’s the ecosystem that they are trying to fill with their projects. Q: What’s the biggest challenge you see facing the industry? A: Diversifying to serve all of our potential customers. I don’t think you necessarily make everyone happy, but you can offer a more layered experience. Little boys tend to make engines; little girls torture people. The challenge is creating one experience that can go off into different directions and can be read on multiple levels. It’s almost the diversity of entertainment. A: Only if the player walks away changed in some way. A: Platform explosion. It’s good for diversity. The iPad, smartphone, consoles interconnected to the net…platforms are diversifying so fast: some in our pockets, some attached to big screen. If you can take a platform agnostic view, it’s very good.